This is a drip design I came up with when I was going to a Flogging Molly concert. I wanted something fun and bright for summer but also rockable. Mission accomplished. Sorry for the bright back lighting but it was the only way I could get the neon colors to really pop and come across! I started with Orly's White Tips to really make the neons pop. I used Milani's Pink Rocks! for the thumb, China Glaze's Orange Knockout for the pointer, Sun Worshiper for the middle, Celtic Sun for the ring and In the Lime Light for the pinky. Here's a tutorial to get the look for yourself. 1. Paint your nail a white base (another light color could work too!) and let it dry. 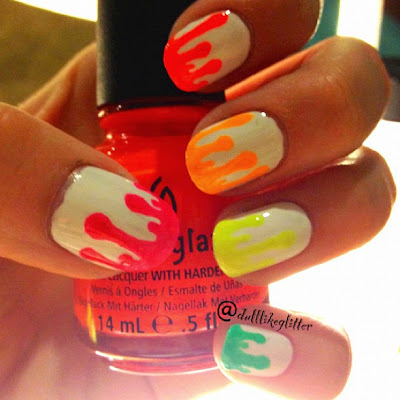 Paint your tip with the color drips you would like. 2. 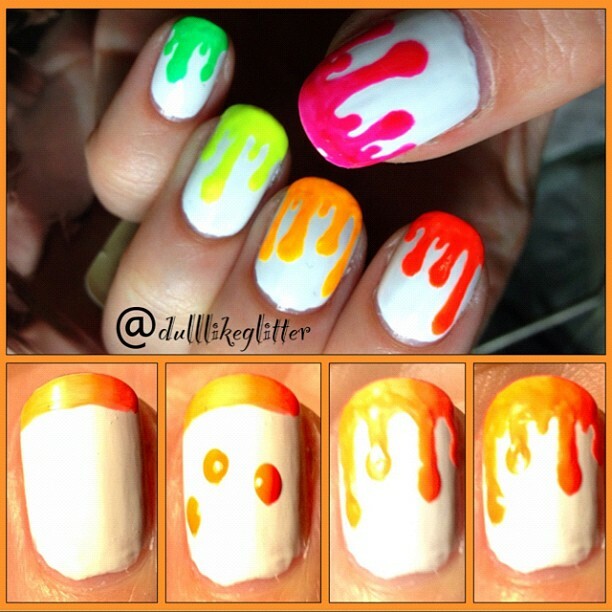 Using a dotting tool or the end of a pin dot some drops at different levels on the nail. 3. Using a small brush connect the dots to the tip in a line. Paint the drips wide towards the top so it appears as if they have collected and dripped down. 4. Add smaller drips in between the larger drips if you desire! 5. Seal the design with a clear top coat. This will make the design look more fluid and glossy. I ended up outlining this design with Sally Hansen's Black Nail Art Pen for an outline and I really liked the outcome. If you've got a steady hand it gives a lot of pop to the manicure. One of your pics was shared on another persons imstagram but I dont remeber who it got thousands of likes! I hope they gave me credit! Unfortunately it happens a lot where people won't an they end up breaking copyright laws and instagram rules. I try to not let it bother me because there's not a lot I can do about it. Instead I just try to be flattered. Thanks so much, i couldn't find a good tutorial on how to do this! My Nail Art Style: Free Hand!